Are you in need of professional office cleaning service and you are in Chiswick W4? We are the company for you! We have been around for years and we specialise in office cleaning. If you want inexpensive, high-quality office cleaning service hire our company. We guarantee you will get what you need and desire. We know that a nice working environment is very important for the employees’ productivity and mood. So we offer you to choose us and we will take care of your office and its atmosphere. 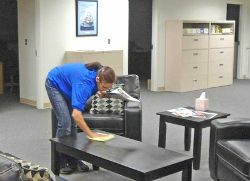 We will not only clean your office thoroughly but we will take care of it. We know how important it is to go to work with desire and enjoy your time spend there, regardless of how much work you do. Our cleaners will come to your office at any convenient for you time and they will do a thorough cleaning of your entire office, bathroom and recreation room. They will perfectly clean every nook and cranny, they will sanitise your bathroom and toilet. What is more, our cleaners are trained to pay attention to the tiniest details, so you can rest assure that your office is in good hands and will be left spotless. They will clean everything, your employees work phones, their framed photos, etc. Our office cleaners in W4 will take out the garbage and put new trash bags, they will reload toilet paper if needed, refill soap, and even water the plants, if you have any. We guarantee you the best care your office has ever seen, because we are the best in Chiswick. Call us now and make an appointment to get the best for your office cleaning needs. We guarantee 100% efficiency and satisfaction. After the first cleaning session you will see a noticeable change in your employees’ moods and productivity. Everyone deserves the best working environment.